Yokogawa Electric Corporation (TOKYO: 6841) announces that the Peru branch of Yokogawa América do Sul (a Yokogawa Electric Corporation subsidiary) has received a control system order from Técnicas de Desalinización de Aguas, S.A. (Tedagua)*1 for a water desalination plant and associated facilities that it is building for Servicio de Agua Potable y Alcantarillado de Lima S.A. (SEDAPAL) in the Santa Maria district of Lima, the capital of Peru. 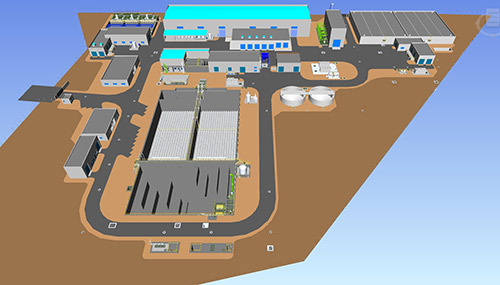 With the Provisur seawater desalination project, Peru's first reverse osmosis*2 desalination plant is being constructed to supply 35,000 m3 of potable water per day to the 100,000 residents of the Santa Maria district. Water distribution and sewer pipelines (total length: 260 km), a sewage treatment plant (daily capacity: 15,500 m3), and an undersea pipeline (780 m) for the discharge of treated water are also being built. Part of the treated water will be used for watering plants in the local area. Expectations are high for this project because Lima and other coastal areas in Peru have a desert climate that get very little rain throughout the year. Yokogawa will deliver the CENTUM™ VP integrated production control system, STARDOM™ FCN-500 network-based control system, and other solutions for monitoring and controlling the project's desalination plant, sewage treatment plant, water distribution pipelines, sewer pipelines, and undersea pipeline. Both CENTUM VP and STARDOM FCN-500 are solutions in Yokogawa's OpreX™ Control and Safety System family. The Peru branch of Yokogawa America do Sul will have overall responsibility for executing the systems side of this project, including engineering and commissioning. Delivery is scheduled for April and the plant is to start operation in June 2019. To "ensure availability and sustainable management of water and sanitation for all" is one of the 17 sustainable development goals (SDGs) for the year 2030 that were adopted by the United Nations Sustainable Development Summit. There are urgent needs around the world to achieve high availability for water supply and water treatment systems. Yokogawa will leverage its know-how and solid track record in executing water supply and water treatment projects in Japan and desalination projects outside Japan to provide solutions that will ensure a stable supply of water and protect the environment in South America and other regions. *1: A major engineering, procurement, and construction (EPC) company specializing in desalination plants. They are a group company of ACS, a major construction company in Spain. Founded in 1915, Yokogawa engages in broad-ranging activities in the areas of measurement, control, and information. The industrial automation business provides vital products, services, and solutions to a diverse range of process industries including oil, chemicals, natural gas, power, iron and steel, and pulp and paper. With the life innovation business, the company aims to radically improve productivity across the pharmaceutical and food industry value chains. The test & measurement, aviation, and other businesses continue to provide essential instruments and equipment with industry-leading precision and reliability. Yokogawa co-innovates with its customers through a global network of 113 companies spanning 61 countries, generating US$3.8 billion in sales in FY2017. For more information, please visit www.yokogawa.com.